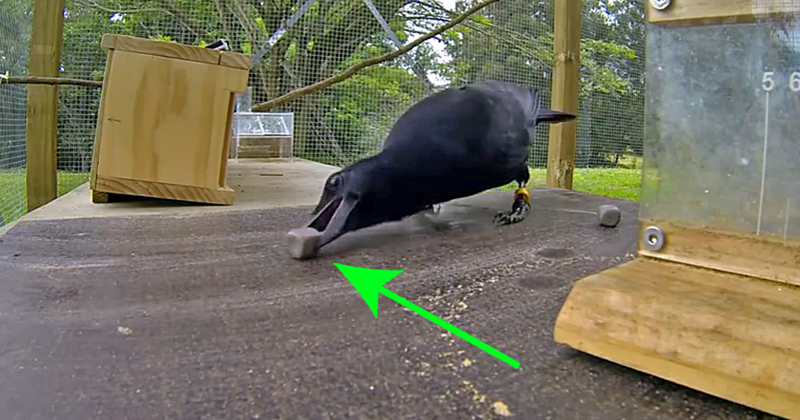 This Crow Stares At a Stick… 8 Moves Later? Scientists Are Shocked beyond Belief! We all know that many animals are smart but crows don’t exactly come to mind when I think of high-level intelligence…as it turns out, crows score very highly on intelligence. In fact, the term “counting crows” comes from a farmer who ran a logic test and observed that a crow could count to 4 or 5. But a more recent experiment goes to show just how intelligent these birds are. A crow was given a puzzle that involves 8 different pieces that the bird is able to see individually. The bird is then shown all the pieces together in one area, and the bird must then figure out how to use all the pieces to retrieve a stick that can reach a piece of food.